The human ego tends to determine the behavior of many people today. When we allow the ego to expand and flourish, we move further away from our authentic self. The early programming and the emotions that massage the ego are explored. As we gravitate to the attraction of the senses, we invite a whole matrix of problems in life. The ego steps in when we feel confident about what we have achieved, learned and experienced. This book discusses the importance of managing the human ego so that we can achieve peace of mind and a sense of equilibrium in this competitive world. We can then discover the spiritual gems within each of us and achieve our true potential. 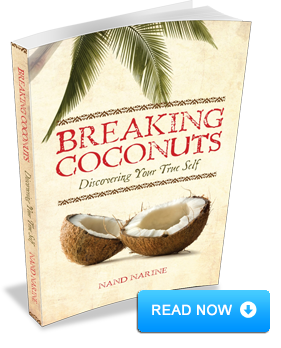 Breaking Coconuts is a book about cracking the ego and breaking free from the need to conform to certain expectations and success criteria. Through various stories and personal experiences the author provides practical advice to go beyond the veil of the ego and create a fulfilling life.